About Tom and Michelle have appeared with Grammy Winners, Rock & Roll and Motown Legends! Born and raised just outside of Boston, the 7-time TRMA National Female Vocalist of the Year has enjoyed a diverse career in the studio and on the stage, appearing with The Coasters, The Drifters, The Platters, Brenda Lee, Loretta Lynn, Louise Mandrell, Lee Greenwood, Jim Ed Brown and Larry Gatlin. Her soul-infused voice has been compared to the likes of Etta James, Linda Rondstadt and Celine Dion. Born in New Jersey and raised in the Chicago suburbs, Tom is a former member of Legendary Folk Group, The New Christy Minstrels -- the group that launched the careers of John Denver and Kenny Rogers. After leaving the band, he went on to a solo career, opening for such artists as Jerry Jeff Walker, Gregg Allman, Willie Nelson, Ray Charles and Jerry Lee Lewis. His voice has been compared to Josh Groban and John Denver. Performing together since 1996, they have performed in 40 states, Europe and the Caribbean, with their refreshing, upbeat approach to 6-decades of popular music. They have opened for American Idols Reuben Studdard and Ace Young, Alternative Rockers Third Eye Blind, Country Band Exile, and Rock & Roll Legends Frankie "Sea Cruise" Ford and Clarence "Frogman" Henry. They have entertained at major events for celebrities such as NASCAR Drivers Bobby LaBonte and Ricky Craven, and in the backyard of the late Hooters CEO, Bob Brooks. Selected to Perform at the National Jimmy Buffet Parrothead Convention in Key West NINE times. Latitude is the first Beach Music/Trop Rock band to perform in Switzerland. 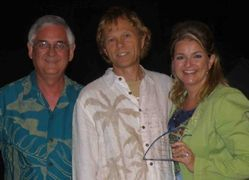 In 1996, Tom and Michelle were burned out songwriters who left their budding careers in Nashville, and headed to Carolina Coast for the summer, performing as the house band at a local resort. That "summer job" changed their lives. Soon, their songwriting began to reflect their new laidback lifestyle, and their newfound dilemma -- They didn't want to go back to Nashville. They wanted to keep their toes in the sand. But, their careers were in Nashville. And, it seemed their time on the beach was coming to an end. Then, their music went viral. People were connecting with their songs. It seems, you either live at the beach, or wish you lived at the beach. And, Tom and Michelle had "written their way" into the life they had dreamed of. Today, the duo tours worldwide, while dividing their time between homes in Pawleys Island, South Carolina, and Punta Gorda, Florida. They have released 5 CD's on the Independent Record Label, "Anchorline Music". 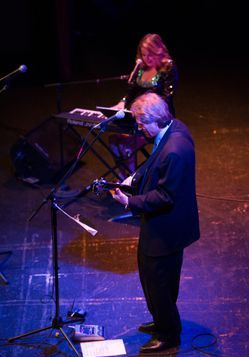 In recent years, the pair has returned to their roots with a popular concert series dedicated to their musical mentors.